This Italian town was originally founded by the Greeks and then taken over by the Romans in 306 BC during the 3rd Samnite War; later to be ruled by North African Muslims. Mario Tozzi in his book Italian Secret, mentions Gravina and the hidden treasure beneath (underground caves). The scenic view for one is absolutely breathtaking. Spend a while just appreciating the picturesque landscape. Museum Museo Pomarici – Santomasi. Museum Diocesasno di Arte Sacra. Parco Nazionale dell'Alta Murgia, Nature Park. Gravina Sotterranea, stunning caves underneath the city. Cathedral of Gravina, built in 13th Century and which houses the relics of Archbishop Thomas Becket and Bishop Roberto. Church of Sant'Agostino, showcasing interesting murals. Church of Madonna delle Grazie displaying baroque art. Many more churches carved out of a special tuff rock. Carry enough change for admission charges. They are not more than a few Euros for each place. Don’t forget to sample Pallone di Gravina, a special firm cheese made from cow milk. 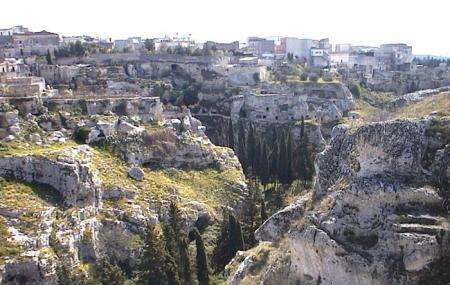 How popular is Gravina Di Puglia? People normally club together Mercadante Forest and Museo Pomarici - Santomasi while planning their visit to Gravina Di Puglia. People also prefer to end their day with Gravina Di Puglia.